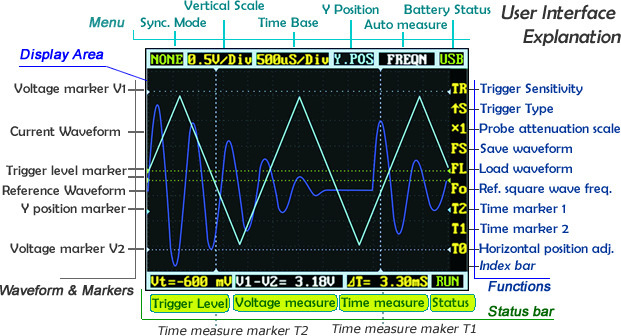 The DSO Nano v3 is a 32bit digital storage oscilloscope. Based on an ARM -M3 SoC, it is equipped with a 320*240 color display, SD card, USB port and rechargeable battery. It’s compact and simple to operate; Excellent choice for people on the go and don't want to lug a bench scope with them. The version 3 of DSO Nano differs from version 2 in that it does not use a white plastic shell. Instead, it uses a much more durable black metal shell, giving it a very nice fit and finish. Trigger modes: Auto, Normal, Single, None, Scan and Fit; Rising/Falling edge/level trigger; Trigger level adjustable with indicator; Trigger sensitivity adjustable with indicator. More information available on the product wiki page.